How do I get a report of specific transactions? 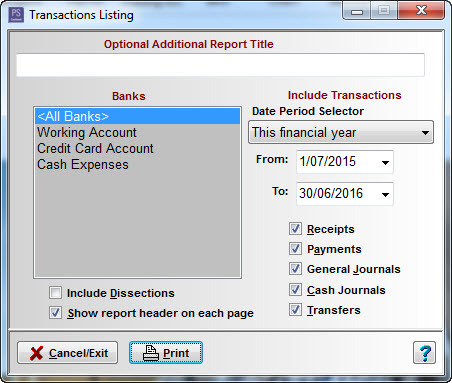 Click on the Reports > Accounting Detail > Transaction Listing menu option. Enter an Optional Additional Report Title or heading note if required. Select the bank account/s required. Multi-selection is available by holding the Ctrl key whilst clicking on each bank account name. Enter the required date range for the report - dates must be within the current financial year. Click the Include Dissections check box to print the dissection detail of each transaction in the report. Select Receipts, Payments, General Journals, Cash Journals and/or Transfers transaction types as appropriate. Click on the Print button to generate a screen preview report - then click the printer icon to produce a printed version if required.